Break The Box: A Message of Hope and Inspiration VOLUME ONE is a devotional like no other. It is uniquely organized to give you a word of the day to meditate on, the devotional itself, questions to contemplate, and a prayer for each day all in a two- volume set. The two-volume format (39 days and 27 days) covers all 66 books of the Bible in an easy to read format. The book(s) have a three-fold purpose: 1) to empower those who preach the Word of God to get started with a bit of exegesis; 2) to give the casual reader inspiration each day as they learn about God's Word; and 3) while reading God's Word, to become closer to The Lord and to be inspired and help the reader along their journey. The title of the book(s) comes from a message preached by D. Michelle Stokes entitled Break The Box: Settling the Issue of Worship. As we break our box in worship, we get closer to the Lord and see Him as He is and ourselves as we really are, more clearly. The two-volume set is meant to be read consecutively in any order...i.e. you can read volume one first then volume two or vice versa. It is the author's hope and prayer that this two-volume set blesses your life and you find hope, inspiration, and enrichment in seeking The Lord and reading His Word! Break The Box: A Message of Hope and Inspiration VOLUME TWO is a devotional like no other. It is uniquely organized to give you a word of the day to meditate on, the devotional itself, questions to contemplate, and a prayer for each day all in a two- volume set. The two-volume format (39 days and 27 days) covers all 66 books of the Bible in an easy to read format. The book(s) have a three-fold purpose: 1) to empower those who preach the Word of God to get started with a bit of exegesis; 2) to give the casual reader inspiration each day as they learn about God's Word; and 3) while reading God's Word, to become closer to The Lord and to be inspired and help the reader along their journey. The title of the book(s) comes from a message preached by D. Michelle Stokes entitled Break The Box: Settling the Issue of Worship. As we break our box in worship, we get closer to the Lord and see Him as He is and ourselves as we really are, more clearly. The two-volume set is meant to be read consecutively in any order...i.e. you can read volume one first then volume two or vice versa. It is the author's hope and prayer that this two-volume set blesses your life and you find hope, inspiration, and enrichment in seeking The Lord and reading His Word! Chicken Soup for the Soul has a slam dunk with its first sports book in years, and its first on basketball, with the Orlando Magic’s very own Pat Williams, well know author and motivational speaker. Pat has drawn on his basketball industry connections to compile great stories from on and off the court. Fans will be inspired, surprised, and amused by inside stories from well-known coaches and players, fascinating looks behind the scenes, and anecdotes from the people who make it all possible — the fans. Some interesting words of wisdom from Pat for athletes and anyone looking for motivation are included. A slam dunk for anyone interested in competitive sports. This book is the published work of Dr. Stokes's dissertation. Understanding the relationship between cultural intelligence, transformational leadership, and burnout is extremely important for the 21st Century leader. Leaders must be culturally sensitive in a globalized society in order to be transformational and less burned out. 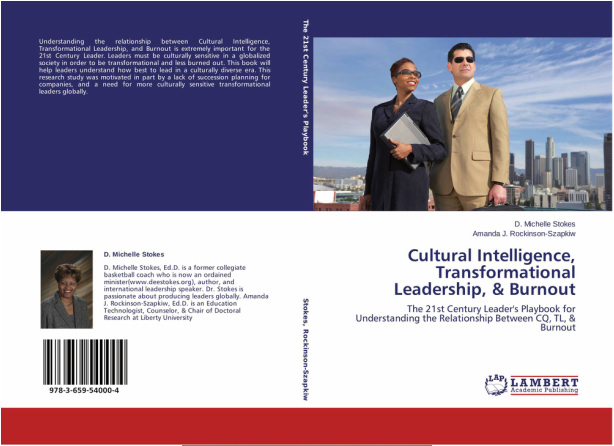 This book will help leaders understand how best to lead in a culturally diverse era. This research study was motivated in part by a lack of succession planning for companies, and a need for more culturally sensitive transformational leaders globally.